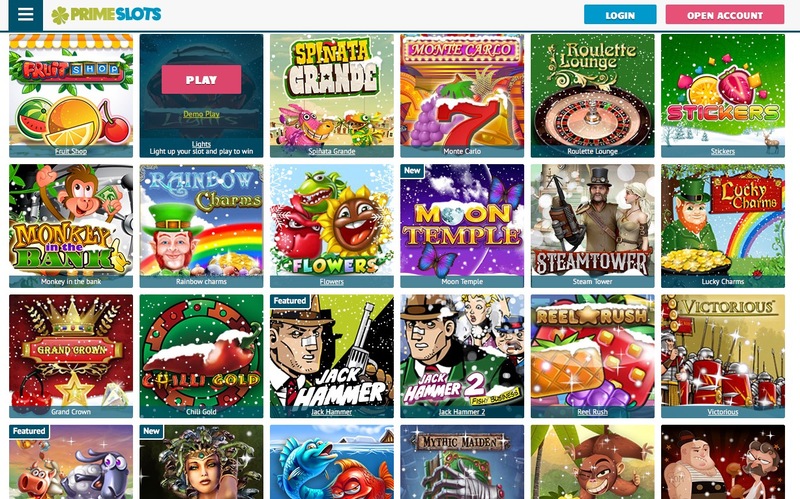 Prime Slots is owned by Prime Gaming, who also own sites such as primes scratchcards. Prime Gaming has been in operation since 2005, making them true veterans of the online casino world. One may assume that having this level of experience in such a competitive industry is always a positive, but that isn’t necessarily true in a world that changes as swiftly as the online casino scene. Having gravitas and heritage definitely helps, but some long-standing sites have been left floundering as new sites changed the game, and they were not able to keep up. From the outset, it looks like Prime Slots may have similar issues. Prime Gaming splitting its output into several sites dedicated to different gaming options seems like something of an outdated idea. Don’t get me wrong, there are those who do it and make it work, the Sky sites and bet365 sites for example, but more often than not, this attempt to split a site into a collection of iGaming horcruxes tends to just dilute content across all the sites, which is the last thing you want if you’re trying to maintain a strong position in this highly competitive market. That isn’t to say there’s no chance that this site will succeed, Prime Gaming have been in the industry for well over a decade for a reason, but can prime Slots keep its position as the market gets increasingly busy? One thing that is often the case with sites that have been around for a long time is that the design concepts are a few steps behind those of newer sites, but this is certainly not the case with Prime Slots. The site swerves the idea of having an immersive concept based on some unrelated subject, a trap that many of its competitors have fallen into, and instead keeps the games as the main focus of the design. There are some nice design aspects outside of this, the logo is simple and effective, the banner across the top of the page that boasts various promotions is strong and attractive, but it is the games that make up the majority of the artwork here. Using thumbnails as part of the design of a site is nothing new, but few execute it as well as Prime Slots, and when you add the mass of information that is also displayed on the homepage, easy of navigation and open and honest information is the order of the day here. With titles coming from Amaya, NetEnt, NextGen Gaming, NeoGames, and NYX Gaming, there’s good variety here in terms of gaming options, but it doesn’t feel like quite enough, especially for a site that is entirely slots focused. That isn’t to say that players won’t find something of interest to them, there is everything from classic three-reel slots, to an array of video slots ranging from the old favourites to new releases, as well as jackpot slots, and they’re all available to play without download. It just feels like a few more software developers providing games for this site would take it up to that next level, and separate Prime Slots from its mass of competitors. When it comes to sites that are focused solely on slot games, Prime Slots is undoubtedly one of the best around, and is well worth checking out, but a few more software developers adding to the games portfolio, and this site would go beyond just being an excellent slots site, and become one of the best online casinos around, so here’s to hoping that happens sooner rather than later. Yes, Make your way through to Champion level and you’ll start reaping the rewards.